Winter flowers for Texas bloom from plants that are well suited to the cold nights and warmer daytime temperatures typical to the Texas climate. Use this climate to your advantage by planting flowers and flowering shrubs. Though winter usually means drab gardens and, in some states, snow-covered gardening areas, Texas winter bloomers will add color and life to your winter garden. Cyclamen plants (Cyclamen persicum) produce winter flowers suited to the cooler months of the Texas climate. Best when planted from October through November, cyclamens display showy flowers in pink, red, white or maroon with variegated green heart-shaped leaves. Cyclamens thrive in shade in well-drained soil that should be watered when the top 1/2 inch of the surface dries. These winter-blooming plants grow to a height of approximately 1 foot, according to the AgriLife Extension Bexar County. Dianthus plants (Dianthus x 'Parfait Series'), also referred to as parfait dianthus and parfait pinks, are annual plants that offer blooms during Texas' winter season. Dianthus displays bi-colored flowers in single, semi-double and double blooms in the following colors: pink, purple, red, salmon, white and lavender with green foliage. Widely used as as edging, dianthus thrives in full sun to partial shade and prefers well-drained soil. Dianthus grows to a height of 1/2 to 1 foot with a width of 1 to 2 feet, according to the University of Florida IFAS Extension. Lenten roses (Helleborus orientalis) are small flowering shrubs well suited to the winter climate of Texas. Lenten roses display small flowers in single and bi-colors including: red, purple, pink, white, blue and green with green foliage. Thriving in partial to full shade with a preference for moist, well-drained soil, this winter-blooming plant grows to a height of 15 to 18 inches, explains the University of Illinois Extension HortAnswers. Johnny jump-ups (Viola cornuta, Viola tricolor), a relative to pansies, are cool season annual plants well suited to Texas winters. Compared to pansies, johnny jump-up flowers are smaller in size and more abundant bloomers with greater heat-resistance, according to the Clemson University Extension. The variety Helen Mount thrives during the cooler Texas months, according to the Texas Gardener. Helen mount johnny jump-ups display small flowers in purple, yellow and lavender. 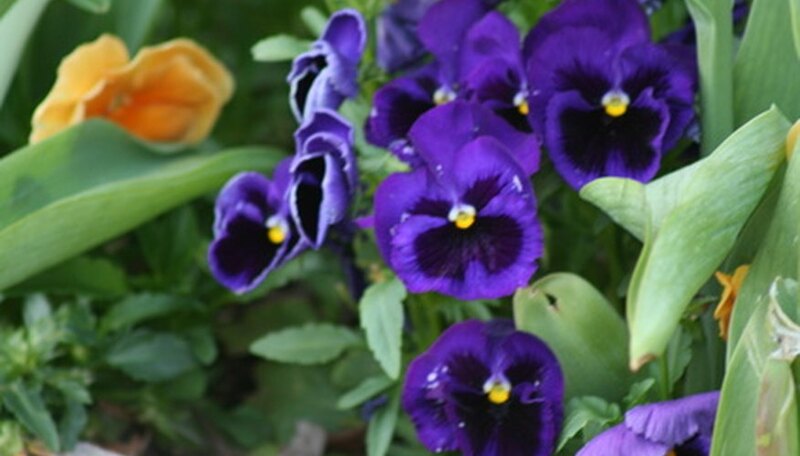 Johnny jump-ups and pansies thrive in morning sunlight and well-drained soil with high organic content. These winter-flowering plants reach a height and width of up to 1 foot. AgriLife Extension Bexar County: Let's All Get Psycho About Cyclamen!